Here we go, guys. The Urban List Culture Edit, otherwise known as Things That Make You Go Hmmm. Art openings, exhibitions, cutting-edge theatre from around the world—if it’s creative and awesome, we’ll be covering it here. Take notes if you want to be super obnoxious at your next dinner party. Opera glasses at the ready, people. An experimental video art series from the renowned Swiss artists Pipilotti Rist (great name). This one’s at the Museum Of Contemporary Art at The Rocks, and it’s spanning the full-length of Pipilotti’s epic career—from early single-channel videos from the 1980s to the large-scale audiovisual installations. The MCA says Sip My Ocean will ‘explore the relationship between nature, the body and technology’. What you can actually expect are giant red sofas, forests of hanging lights, a maze of floating fabric and movies you watch on the ceiling. Circus cabaret is one of those divisive theatre experiences. Some people get really into it, others think it’s strange and uncomfortable. If a cast of demi-gods, a femme fatale leader named Heather Holliday and beatboxing pole-climbers sound like your thing, get on down to Limbo Unhinged at The Sydney Opera House. It’s the latest show from the creators of Blanc de Blanc, and it’s running until 3 March. It’d be hard to fit more culture under a single roof. 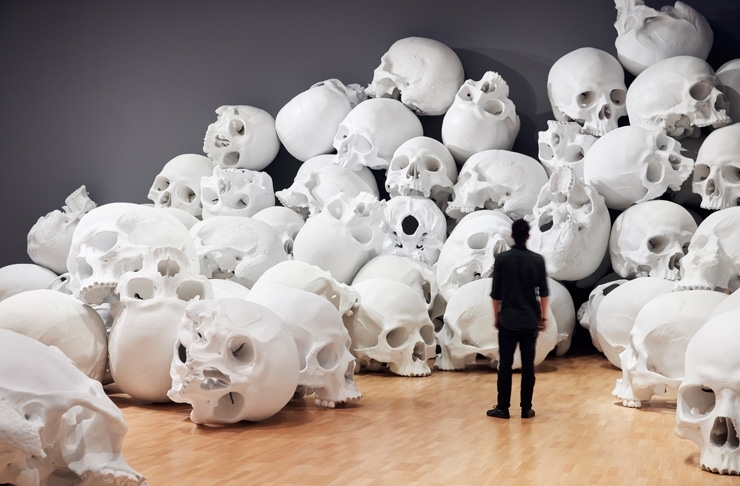 Melbourne’s National Gallery of Victoria launched their first Triennial Exhibition late last year, and it’s all kinds of awesome. 78 artists from 32 countries have come together to create a 4-level monument to Weird. Panels that ‘smell like Melbourne’, virtual reality pirate ships, a carpet that looks like the Earth, a fake apartment covered in 10,000 red flowers—you can find them all at the NGV until 15 April. Oh yeah, it’s 100% FREE. Perth’s biggest culture fest is just around the corner. Kicking off on 9 February, there’s gonna be a massive line-up of circus acts, cabaret, classical music, dance, theatre and film taking over our favourite west coast city. Whatever you do, don’t miss Siren Song—an eerie soundscape that’ll blast through the Perth CBD at dawn and dusk each day, turning the city into one gigantic reverb chamber (it actually sounds like this will be quite hard to miss, even if you wanted to). Brisbane, you’ve still got a couple of months left to check out Picasso’s trippy etchings at QAGOMA (is it just me, or is that the worst acronym of all time?). The ‘Vollard Suite’ is a series of 100 engravings and aquatints by Pablo Picasso, completed in the 1930s. Approximate value: $10billion (probably not, but it’d be a lot). 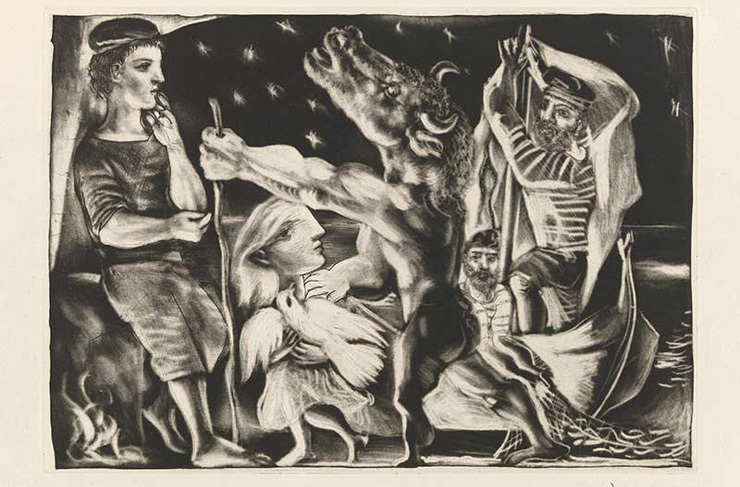 A lot of these etchings feature minotaurs and Pygmalion depictions (Picasso was going through a minotaur and Pygmalion phase), and they’re hanging alongside select works from the QAGOMA collection. Check it out before 15 April. Brisbane Comedy Festival may not be the biggest event on Australia’s laugh calendar, but it IS the fastest growing. This year there’s more than 70 local and international acts taking part, hosting shows at the Brisbane Powerhouse, City Hall and SunPAC. Think big name funny people like Peter Helliar and Akmal, plus overseas legends like Jeff Green, Rich Hall and Des Bishop. Pro tip: check out Melbourne upcoming comedy sensation Demi Lardner. One to watch. It’s very hard to explain ALONE as a concept. If we told you that you’ll be chased down a corridor that suddenly turns pitch black by a mysterious hooded figure, who then hands you an iPod and tells you to follow the directions played through crackling earbuds, would that peak your interest? There’s a reason this thing has gained cult status in Los Angeles. If you see Melbournians acting very strangely on the streets of the CBD this month, you’ll know why. They’re having their minds very gently blown. ALONE kicks off in Melbourne on 14 February. The Obliteration Room has been running around the world since 2002. It’s a pop-up art installation from renowned Japanese artist Yayoi Kusama. The idea is pretty simple: there’s a big, stark white room, and visitors are encouraged to participate in the work by placing coloured dots on every surface possible. If you haven’t dropped by yet, the exhibition is looking like the inside of a hundreds & thousands jar right now. Swing by the Auckland Art Gallery. It’ll be running till 2 April. Get ready to party like it’s 1614. 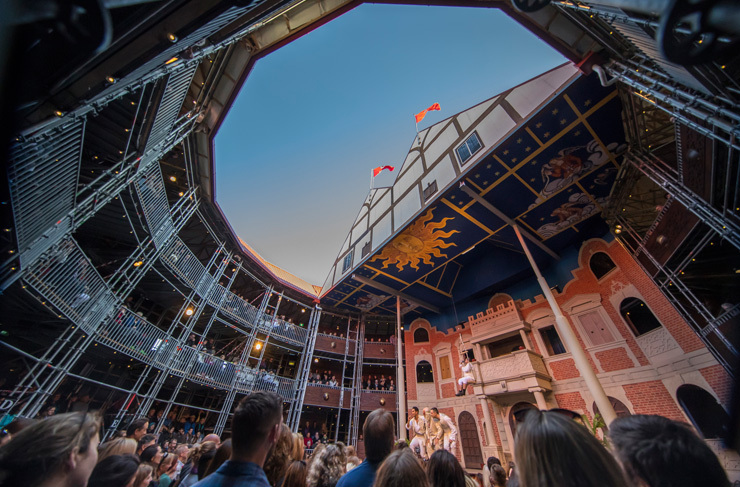 The Pop-Up Globe Theatre Company are running five of the bard’s classics this month, including A Midsummer Night’s Dream, The Merchant Of Venice, Macbeth, The Comedy Of Errors and Julius Caesar. You’ll find it near the Ellerslie Event Centre, just off the Southern Motorway. The Globe will be around for a little while yet, but if you haven’t checked it out, we highly recommend booking a date. This isn’t like high school Shakespeare – the production team do a great job of keeping the material fun, funny and (most importantly) understandable. Friday Night Frights sounds terrifying. It’s an interactive scare-a-thon, designed by New Zealand’s premier visual FX guys, and takes place on the set of an abandoned reality TV show (this is starting to sound like the plot to a Goosebumps novel...) There are five sessions running every Friday night, with a special ‘scaredy cat’ session at twilight for any unashamed wusses. We recommend clearing your Saturday schedule to get over the trauma. Want to talk exclusive? Hamilton is the hottest musical in the world right now. Probably the hottest musical in the history of the world. Tickets cost a mint, and it’s booked solid until August this year. But hey, if you’re travelling to London in winter, you could do worse than see the story of US Founding Father, Alexander Hamilton. Seriously, no-one who has seen this thing has done anything but gush like crazy. If it was on Rotten Tomatoes, it’d be sitting at 171% approval. Prepare to spend big though – these tix don’t come cheap. If you’re heading to NYC this month, you’ve probably got The Met and the Guggenheim already locked in, but try to make some time for Nathaniel Mellors’ new exhibition at the New Museum Of Contemporary Art on the Lower East Side. It’s a weird satire of contemporary culture—a little bit of video, a little bit of sculpture, a little book-eating monster called ‘The Object’ that digests libraries. Always wanted to see a Neanderthal in perpetual free-fall over the San Joaquin Valley? Now’s your chance. Expect the unexpected. Probably the hottest museum ticket in the world right now. The Yayoi Kusama Museum opened in October last year, and it’s already making international waves. It’s the first museum dedicated entirely to bewigged contemporary artist Yayoi Kusama. The building itself looks bizarre—a smooth white and glass tomb from architect firm Kume Sekkei. Start your way on the ground floor and work your way up. 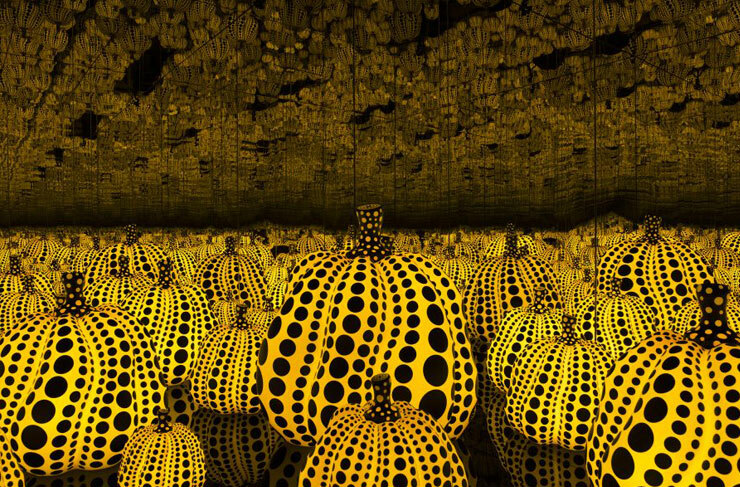 Try and resist the urge to Insta everything—Kusama’s work requires proper attention.